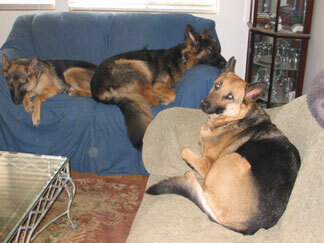 Thanks for visiting this German Shepherd breeder directory. Here you may find all sorts of German Shepherd breeders listed from all over the US, Canada, Europe and many other countries. This will certainly be a work in progress as ads from various German Shepherd breeders and other German Shepherd Dog professionals begin to start coming in from all over the world - so please bear with us and check back often as we build this resource for you. Please keep in mind that this GSD Breeders Directory provided here is only listed as a convenience for our readers and that inclusion in our German Shepherd Directory is not an endorsement of any kind for any breeder or kennel found within. My best advice to you is, at a minimum, ALWAYS to research any breeder you intend to use before bringing any German Shepherd Dog or puppy home with you.